On Thanksgiving Day, Nate (my sister's new FIANCE :)), Ryan, and I were en route to Children's Hospital to pick Julia up from her overnight shift. While at a stoplight, a man in a truck next to us waved his arms to get our attention. I rolled down the window and he casually mentioned that we had a cupcake sitting on the back of the car. I looked over my shoulder to discover that it was not a cupcake, but a pumpkin cream cheese muffin, precariously resting on the edge of the trunk. It must've looked appetizing, because the man continued to question me. "Is that indeed a cupcake?" I told him it was a muffin and the light changed before we had a chance to grab the escapee (okay, false. The boys refused to get it from outside because they wanted to see if it would make it all the way to the hospital!). The muffin managed to stay on the car a few more miles and when we pulled into the hospital parking lot, Ryan promptly grabbed the muffin and ate it! I'm very glad we didn't lose a muffin en route, because these are too good to be run over on the highway! These muffins require multiple steps and a bit of attention, but the end result is oh so worth it! My cream cheese mixture wasn't freezing very well, so I just spooned it into the muffin cups instead of slicing pieces and it still worked wonderfully. 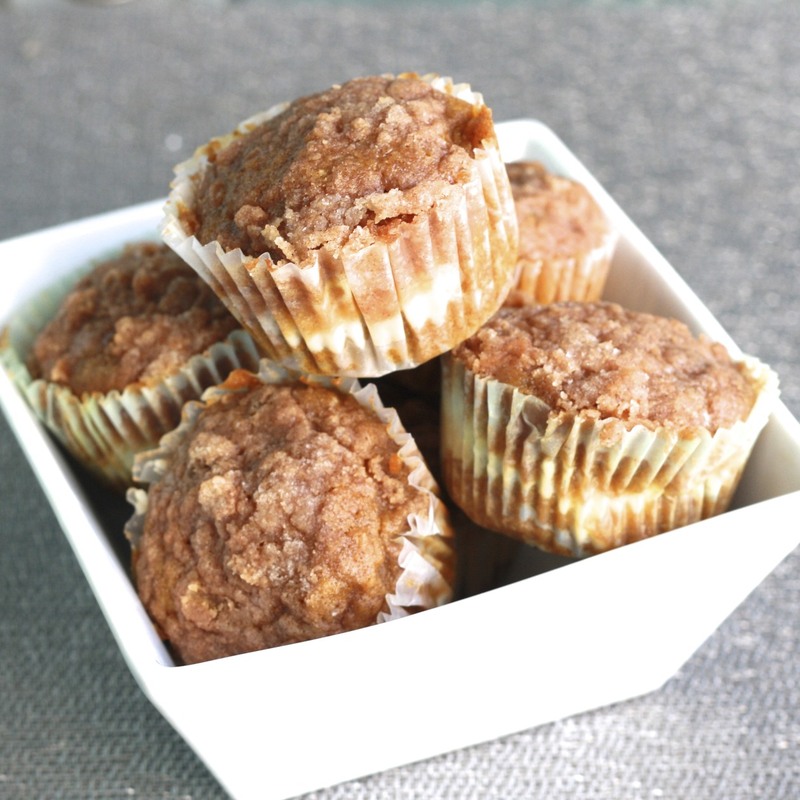 These muffins are perfectly spiced, with a streusel that puts them over the top! Hopefully you still have some pumpkin hanging out in your cabinet because you don't want to wait until next Fall to make these! 1. Combine the cream cheese and confectioners' sugar in a mixing bowl, beating until smooth. Place the mixture into a piece of plastic wrap and shape into a log (1.5 inches in diameter). Cover the wrapped log in aluminum foil and place in the freezer for 2 hours until slightly firm. 2. To make the muffins, preheat the oven to 350F. Line 24 muffin cups with paper lines. In a medium bowl, mix the flour, all of the spices, the salt, and the baking soda. Stir to combine. 3. In a large bowl, add the sugar, eggs, pumpkin, and oil. Use an electric mixer to mix on medium-low speed just until blended. Add the dry ingredients, mixing just until combined. 4. To make the topping, mix the sugar, flour, and cinnamon in a small bowl. Cut in the butter with a pastry blender or two forks until the mixture is coarse and crumbly. Refrigerate mixture until ready to use. 5. 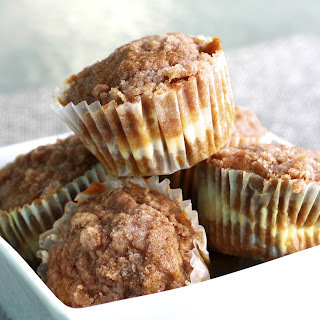 Fill each muffin cup with 1-2 tbsp of batter, just enough to cover the bottom of the muffin cup. Slice the cream cheese log into 24 pieces. Place a slice in each muffin cup on top of the batter. Top each muffin cup with remaining batter. Sprinkle topping over each of the muffins. 6. Bake for 20-25 minutes. Transfer muffins to a wire rack and cool completely before serving.